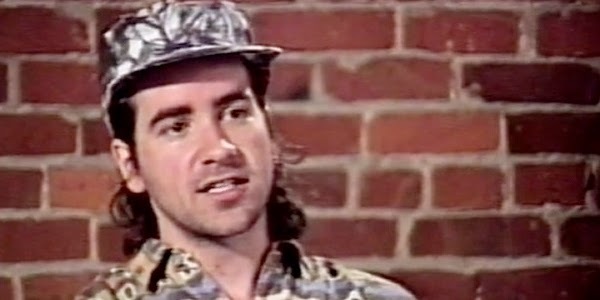 Before Clerks, the legendary low budget indie movie which inspired a generation of slackers, Kevin Smith produced his debut film Mae Day: The Crumbling of a Documentary during a short-lived stint as a film student. Like Kid Icarus and Lost In Manchuria, Mae Day is a documentary about the collapse of a movie - one in which the entertainment stems from disaster. Co-directed with Scott Mosier, Smith's short project was initially intended on sensitively portraying the life of a local transsexual entertainer. Yet, due to poor planning and organisation skills, it becomes apparent that the film will never get off the ground - the subject has become un-contactable and shooting, thus, must be postponed indefinitely. Whilst many would accept failure at this point, Smith and Mosier show an ingenious level of resourcefulness. Mae Day changes forms entirely as the co-directing duo turn the cameras back upon themselves in a Mea Culpa of sorts - their documentary is no longer about a transsexual entertainer, but rather, the failures of a team of student film-makers to create such a documentary. Smith and Mosier point their cameras at their peers who discuss the project, and the lack of professionalism and planning on display, and their teachers too. Rather remarkably, Mae Day may well be the smartest film of Smith's uneven career - a deep understanding of the non-fiction film form is on display as the students' dissect such film-making techniques with gleeful abandon. Its a documentary about the documentary form, a film about film and is rather smart in a reflexive manner - the stitches which hold the genre together are on full show rather than hiding. Subjects ask for second takes and Smith and Mosier's lines seem rather rehearsed, written. Mae Day is a wryly humorous, post-modern dissection of student movie-making - a clever film from a director more known for excelling in the studiously dumb.